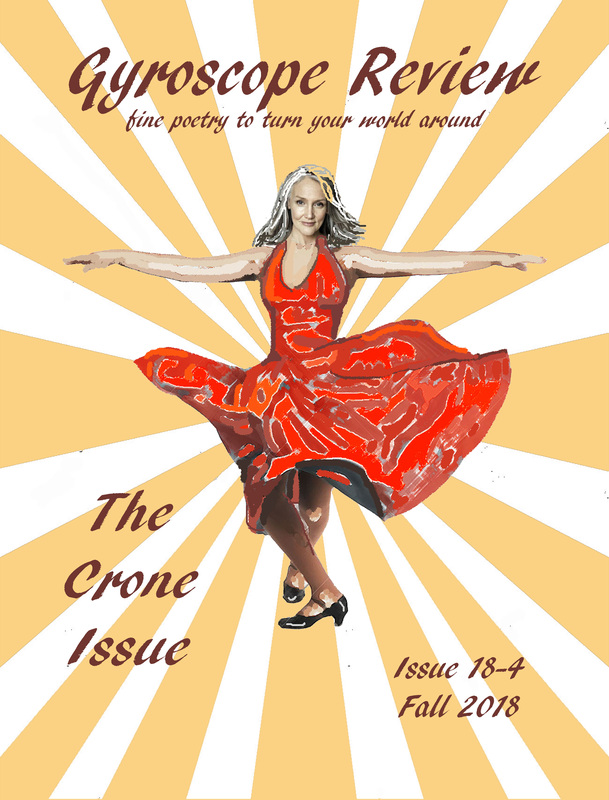 We welcome you to explore our special fall 2018 issue of Gyroscope Review: The Crone Issue. This highly-anticipated issue surprised us by eliciting an intense response from poets who sent work for our consideration. We are so grateful to have opened our doors for a demographic that is too often pushed aside even as they have powerful words and visions to share. This issue offers 41 authors, some of whom are not over-50 women poets but whose poetry, which came in through our general submissions, nicely dovetails with the themed work. We hope you will not only enjoy this issue, but will find yourself moved to think about and discuss this work for a long time to come. To purchase a Kindle edition, click HERE. To view our PDF version, click HERE. To let us know your thoughts about this issue, contact us HERE. Thank you to all the amazing poets who made this issue possible and thank you to all who choose to read and share this issue of Gyroscope Review. One more thing – our submissions are open for our Winter 2019 issue. Please read our guidelines to fully understand what we look for in the poetry that is sent our way.